"Mr. Heavy Metal" Marty Friedman performs Hatikva with Japanese metal band in Israel. Jewish former Megadeth member rocks Tel Aviv. If you are neither a metalhead, nor Japanese, the name Marty Friedman could sound like the Jewish guy from next door. But if you like heavy metal music, the name Marty Friedman is very familiar. He is considered one of the best guitar players in the world, serving as lead guitarist with the Grammy Award nominated band Megadeth, and also known for his many side projects and solo career. If you are Japanese, then the Friedman name is synonymous with Mr. Heavy Metal, the workaholic rock guitarist, with long curly hair, who last-but-not-least covers popular j-pop (Japanese pop) songs and turns them into instrumental heavy metal pieces. Originally from Maryland, in the United States, Friedman performed in Israel for the third time on May 31. Friedman was born in 1962 and his musical career is more than impressive. After playing lead guitar in lesser known bands, he founded Cacophony with fellow guitarist Jason Becker. His first of many solo albums, Dragon's Kiss, was released in 1988. But the biggest milestone in his career was in 1989 when he became lead guitarist in the already world-famous thrash metal band, Megadeth, which played in Israel this year for the fourth time. Lead singer Dave Mustaine was born Jewish as well. Friedman toured the world and recorded five studio albums with Megadeth including some of their best selling albums ever from 1990's Rust in Peace until 1999's Risk. To be the lead guitarist in such a strong band is the dream of every musician in the field, but Friedman wasn't completely satisfied. In late 1999 he left to play different styles of music and to live in Japan. After the move his career continued and developed quickly not only as a guitarist, but also as a producer and media personality. Friedman had his own TV show, which he hosted in fluent Japanese, called Rock Fujiyama. He has appeared often in local media, earning the nickname HebiMeta San, or Mr. Heavy Metal. Always working on new projects in different styles, in recent years Friedman performed together even with j-pop, pop-punk and trance musicians. But don`t worry, in his solo albums he sticks with instrumental rock and metal, even when he is covering j-pop songs. His new solo album, Bad D.N.A. was released in Japan in August last year. Friedman and his band started their European tour in April of 2011 with the Tel Aviv Reading 3 show as the final stage. The organizer and producer of the concert was Yishai Swartz of Raven Music, who has brought many famous heavy metal acts to Israel and is expected to bring many more. Reading 3 is a mid-sized club in the Tel Aviv port. The show opened with Hatikva, Israel's national anthem, performed on electric guitar. It wasn`t a surprise because Friedman's 2007 performance in Israel also opened with Hatikva. A YouTube video of the performance with the excited crowd singing along now has over 97,000 hits. Friedman's virtuoso guitar playing with unique techniques were as trademark as his long curly hair. His band was composed of extraordinary Japanese musicians. Although quite young, their musical professionalism, talent, enthusiasm and enormous motivation showed. The drummer was exceptionally energetic and communicative, even though he only used gesture language, and quite a character. It seemed like he could easily become a leading actor in a traditional Japanese theater. There was excellent cooperation between the legendary guitarist and his band. Despite performing with such intensity, the show came close to two hours. They played 24 songs including Thundermarch, a classic from Friedman's first solo album, It's the Unreal Thing, Elixir and a couple of j-pop covers such as Yuki no Hana from the Tokyo Jukebox. All of it was peformed with electric guitar and distortion. Even if the audience didn't know the original songs from a totally difference genre, they still rocked. During the intermission, Friedman talked about the Tsunami tragedy which is haunting Japan, and mentioned how much he loves Israel. It might be a given that a Jewish artist loves Israel, but today unfortunately is not taken for granted. Some musicians have even refused to perform in Israel. To hear a performer stand on an Israeli stage and state his fondness for the country could be politeness, or empty words. But in recent years, "I love Israel" is definitely a statement. It was announced months before on the Internet that Friedman was to conduct a jam session with a famous Israeli rock guitarist. After the finale, the band returned to the stage with Yossi "Sassi" Saharon, lead guitarist of Orphaned Land, the most well-known Israeli metal band abroad and one of the pioneers of the Middle Eastern metal genre. Saharon is also one of the best known metal personalities in Israel. There are many famous Jewish rock musicians and entertainers in the world. Not as many come here to play. Even less consider moving to Israel. The Israeli music industry has certain shortcomings as well. There are certainly many underground genres which should have more appreciation, support and publicity. Many quality Israeli hard rock, metal, and alternative rock bands have recently earned success overseas: Orphaned Land is one, Salem is another. Israel can become attractive in this musical world as well. 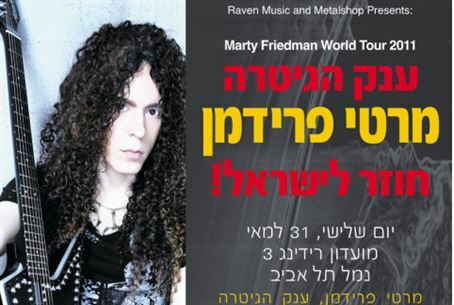 The Marty Friedman show would have been great anywhere in the world, but to see such a quality musical group in Israel added some extra flavor. Adding the fact that Friedman is Jewish and played Hatikva made the show quite special for the Israeli metal fan. Gabriella Licsko is the host of the Welcome to the Tribe podcast on Arutz Sheva - Israel National Radio. She a lecturer on Jewish history and society and leads tours of different Israeli neighborhoods across the country.